14 July 2016 — Today’s release of NVIDIA VR Funhouse extends our role in the gaming ecosystem to that of a game creator. For nearly a decade, NVIDIA has been developing PhysX, an SDK that allows physically accurate simulation of a 3D environment. It’s provided advanced visual effects for more than 500 PC and console games. When we first saw some of the early VR games and experiences, we quickly realized that something was missing: there was little to no physics simulation. Because VR places you inside of the experience with the ability to touch and interact with virtual objects, it is critical that those objects behave and react in realistic ways. Unlike traditional PC games, physics in VR games is not just visual effects. NVIDIA PhysX Destruction to make shooting game targets that realistically chip and explode when hit. NVIDIA FleX to make the realistic cloth on the curtains, streamers and basketball nets. It’s also used to create realistic fluids for in the clown balloon race game. NVIDIA Flow to make particles realistically respond to moving solid objects and turbulent fluid motion. You see it when players pop the confetti filled balloons and use their swords to cut through and interact with the confetti. Flow is showcased when you use the bow & arrow to light your arrow on fire, shoot it and watch the targets burn. NVIDIA HairWorks to make the lifelike hair in the Whack-A-Mole and Punch-A-Mole level. Simulating physics takes incredible processing power, and we found it by applying NVIDIA VRWorks technologies, including Multi-Res Shading and VR SLI, to increase rendering performance. To encourage developers to experiment with our SDK, we’re going to be open sourcing VR Funhouse later this summer. We fully expect that developers, enthusiasts and artists from both the VR industry and game industry will build their own mini-games. To achieve our goals, we created VR Funhouse as an enthusiast’s experience, not a ‘min-spec’ experience. We recommend that you experience it on a GeForce GTX 980 Ti, or GeForce 10 Series GPUS. The best, most immersive experience will use dual GeForce GTX 1080s. 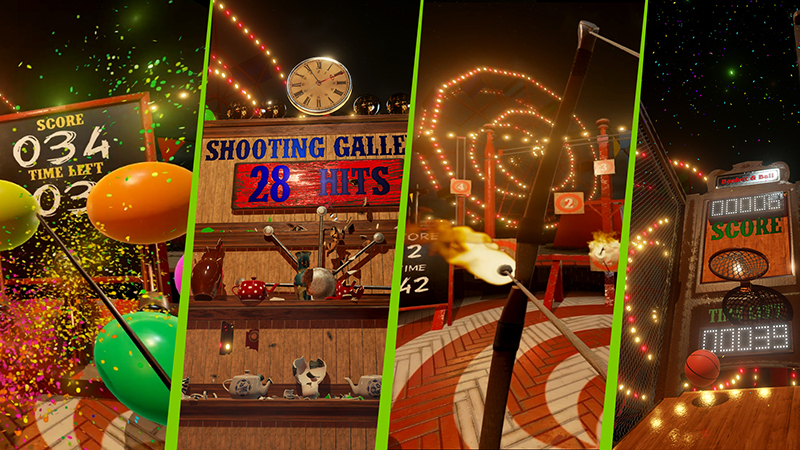 To experience the fusion of state of the art graphics and realistic physics modeling in a VR game, download NVIDIA VR Funhouse on Steam today.